A few months back rumours of a Bruce Springsteen and the E Street Band tour of Australia had Hughesy doing a spot of calculating to see whether the finances would run to multiple shows on tour. The conclusion I came to at the time was that, yes, starting from the first show which was probably in Brisbane, I could keep on trying for tickets (second show in Brisbane, first Melbourne, second Melbourne, first Sydney, second Sydney and anything tagged on after that) until I missed a ticket for a show and at that point I could stop. Now, having listened to Wrecking Ball a couple of months after those rumours I'm beginning to doubt whether the rumoured tour was ever likely to have gone ahead. 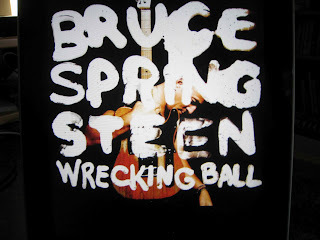 The 2003 Tour, with set lists heavy on material from The Rising was, by all accounts, a financial disaster zone and you'd expect the subject matter on Wrecking Ball would have promoters Down Under wondering whether it'd be likely to produce significant bums on seats action, or enough action to recoup the costs of bringing a significantly expanded E Street Band and entourage half way around the world. Now, the reader might be wondering what Hughesy's inclination to attend multiple concerts has to do with the new Springsteen album, but I should start by making it clear I'm a serious fan coming off close to forty years' exposure to one of the giants of the rock era. That's a significant consideration since Down under reactions to Bruce tend towards the lukewarm as far as the average punter is concerned. How you like your Bruce is, of course, the factor here, and if you're a non-Bruce type Wrecking Ball's hardly likely to change your attitude and bring you aboard the train that's heading for the Land of Hopes and Dreams. From the opening notes of We Take Care of Our Own it’s obvious we’ve got a Springsteen album in front of us. Listen to that intro and you’re left with only two likely candidates, with the second one being a Bruce clone. Go a little further and the listener could be tempted to file Wrecking Ball into the same proudly patriotic category where certain misguided individuals tend to file Born in the USA, but a closer examination of the lyrical content reveals a degree of uncertainty lurking under what sounds, on the surface, like another exercise of tub-thumping chest pounding American exceptionalism. Dismissing the track on that basis would be easy to do on a first listen, particularly given the fact it's the first single off the album but in doing so you'd be neglecting the way Springsteen works. A closer listen reveals a voice asking if this is the way things are supposed to be, why aren't things the way they're supposed to be? Where’s the promise from sea to shining sea? is a good and perfectly apposite question. We tend to forget, and among the posturing of right wing nationalists forgetting isn't a difficult thing to do, there's a strong left wing tradition of co-operation and working class solidarity that dates back through the Great Depression and the Civil War to the American Revolution. It hasn't always been obvious, and was the sort of thing that troubled all sorts of commentators through the past two hundred and twenty years, but it has always been there lurking in the background. And in the wake of the Global Financial Crisis it's starting to stick its head up again. Springsteen was a supporter of Yes we can Obama, you can see similar sentiments turning up in his work as far back as The Promised Land and he’s always been addressing problems that confront the ordinary bloke in the street in tough times. The guy that wears a tie, Wall Street greed and corruption and the subsequent impact on main street America are more recent concerns. So for half the album we’ve got the denunciation of the way things are, followed by the reminder that this isn’t the way things are supposed to go. While the album kicks off with We Take Care of Our Own and you could be forgiven for dismissing things as Born in the U.S.A. Revisited that veneer of patriotism in the chorus is undercut by references to the days after Katrina, abandoned ideals and the dark side of the American dream in a country that Springsteen sees as badly in need of help. There’ll be candidates in the forthcoming election who might be tempted to appropriate the song for campaign purposes, but listening to the fist pumping anthemic, choruses the hey-heys about faith and country I was reminded of a cartoon in the late sixties or early seventies where a hairy revolutionary issues a reminder to his peers. We Take Care Of Our Own is unmistakably Springsteen, booming drums and chiming guitars, as Bruce outlines the theme that runs through the album. People in need of assistance have no choice but to help themselves and each other. There ain’t no help, he sings. The cavalry stayed home. We take care of our own, in other words, because there’s no other choice. Through Wrecking Ball some of the angriest messages are wrapped around tunes almost guaranteed to get the toes tapping and the hips swivelling. The message on Easy Money and Shackled and Drawn might be a scathing attack on fat cats and the goings-on up on banker’s hill, but they’re danceable as all hell. Easy Money starts out in Atlantic City territory, heading out for a night on the town and an escape from the reality of day to day burdens in a jaunty Irish-folk number that sounds like we’re out for a good time. Well, we are, but along the way we’ll be collecting what’s rightfully ours, carrying a Smith & Wesson .38 with hellfire burning in the belly in a get square with all them fat cats who’ve been getting away with murder and now it’s time for a little evening up. And if it seems like they’re going a step or two too far, there’s Shackled and Drawn, which still sounds like we’re having a good time though a closer listen reveals things aren’t quite as cheery as the sound of the chorus suggests, and there’s no doubt about the sentiment in the words. The outcome of that Shackled and Drawn situation comes as Jack of All Trades slows things down, underlining the message. Sure, he’s a man who’ll take whatever work he can find and do whatever he needs to turn his hand to, and, yes, Honey, we'll be all right, but he knows why his family’s in this pickle and if I had me a gun, I'd find the bastards and shoot 'em on sight, says the guy from the new permanently freelance working class, without health or social security benefits or, by this point, patience. So the messages don’t pull any punches. Death to My Hometown turns straight towards the greed of Wall Street bankers, congressional impotence and the crisis they’ve brought down on the average Joe’s head. There’s an obvious allusion to the nostalgia of My Hometown on Born in the U.S.A, but close to thirty years later the vacant storefronts are gone. The marauders raided in the dark/And brought death to my hometown, and though the damage is done, there is no point in wallowing in self-pity. This Depression delivers four minutes of droning guitar and a narrator on the point of giving up, and delivers the listener to the album’s turning point. Wrecking Ball, originally a tribute to a venue about to be demolished when Springsteen and the E Street Band played there in 2009 and revised to cover the demolition of the Spectrum in Philadelphia was originally written from the stadium's point of view, but in the context of the album it becomes a call for perseverance and rolling with the punches. If there’s a weak point on the album, You've Got It is probably it, sounding like the work of a rather inept Springsteen clone but it’s largely there as a precursor to another set piece in the form of Rocky Ground where a surprisingly effective rap and a massed gospel chorus call on the congregation to stick together through times of adversity. It’s the start of the run of there's a new day coming tracks that bring the album proper (there are a couple of bonus tracks tacked on at the end, as is S.O.P. these days) home in a rousing mood of This Land is Your Land defiance. And that defiance comes through in Land of Hope and Dreams, first performed on the 1999 Reunion Tour, included on 2001's Live in New York City and tackled again during the sessions for The Rising. It proved surplus to requirements in that environment, but here, coming off the new day coming theme of Rocky Ground, echoing Curtis Mayfield's People Get Ready and boosted by two Clarence Clemons sax solos, the train metaphor works the dream that’s the diametrical opposite of what Bruce was on about back in We Take Care of Our Own. That was the way it’s supposed to be but isn’t. This is the way it can be if we take that Rocky Ground defiance and work in together. People get ready/You don’t need no ticket/You just get on board, regardless of race, class or creed. That race, class or creed bit comes through in the campfire song ambience of We Are Alive, invoking martyred strikers, defiant protesters, and oppressed migrant workers. There’s a mariachi horn riff that invokes Johnny Cash's Ring of Fire and a lyric line that draws the two halves of the album together as Springsteen invokes the subjugated dead, the ghost of Tom Joad,and the generations of freedom fighters in a nation that conveniently forgets that much of its early success was built on slave labour. From there, the bonus tracks are a mileage may vary situation, and I could definitely have done without the mournful Swallowed Up (In the Belly of the Whale) in the slot it occupies in this running order (that won’t be an issue when we get into Hughesy’s Top 1500 Most Played shuffle mode, will it? ), but American Land written and recorded during the 2006 Seeger Sessions and a regular inclusion in the set list thereafter delivers a barnstorming Irish jig about the American Dream and the way things should be. It’s a track that could have worked in the Land of Hope and Dreams slot, though LoHaD does the job marginally better. By this point, of course, it should be fairly obvious to the discerning reader that Wrecking Ball is coming from a particular world view, and your reaction to the album is going to stem largely from the extent to which the listener’s viewpoint coincides with the sentiments expressed herein. Springsteen is angry and accusing in these songs, and from where I’m sitting he’s got every right to be. He’s seeing a scorched earth America, razed by profiteers as charlatans and ideologues undermine democratic values while the line their own pockets in the name of freedom and the real business of politics in a democracy– responsible government and an equitable distribution rather than a steady accumulation and segregation of wealth– is pushed to one side. We are, in other words, in Woody Guthrie This Land Is Your Land territory, and while there’ll be some of my friends and acquaintances who won’t agree all I can say is more power to your elbow, sir. What we have here is a carefully designed collection of songs, sequenced to deliver a message, the work of a man who might have every right to take it easy and coast on the strength of past glories like the dude in Randy Newman’s I’m Dead (But I Don’t Know It). In other words, Mr Springsteen is firing on all cylinders. How many performers looking down the barrel of their sixty-third birthday can you say that about?